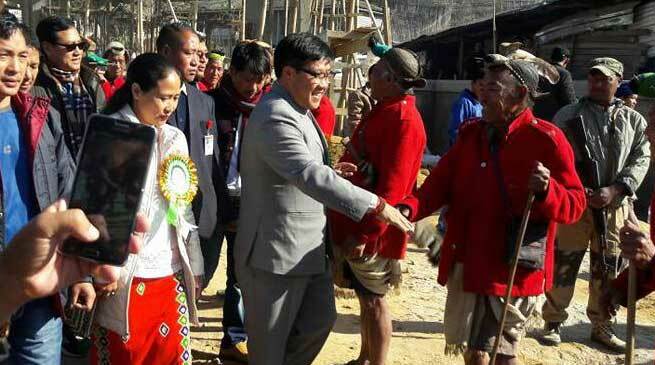 Minister of Home, RWD and Labour & Employment Kumar Waii has made a two days whirlwind tour of Chayangtajo and Bameng ADC Hqs of East Kameng district respectively to assess and generate awareness regarding developmental and infrastructural needs of the areas. Starting from Chayangtajo, he attended the labour awareness programme being organized by Arunachal Pradesh Building and Other Construction Workers Welfare Board (APBOCWWB) and distributed TV sets, raincoats and gumboots to its registered workers. He urged the labour force to work sincerely and dedicatedly. Attending the 8th General Conference of All Pipu Chayangtajo Gawepurang Sawa Students’ Union (APCGSSU) during his visit, he recalled the past achievers from the area and simultaneously, exhorted the student community to follow their footsteps. Attacking vociferously against the early and forced marriage, he advised them to study hard and make the parents, kin and society proud. Acknowledging that education helps in every aspect of life from farming to politics, he suggested them to accord top most priority to education. He made an appeal to the student organizations and NGOs to spread awareness about other positive aspects of education which include personality and character development and others. Addressing the general public, govt. functionaries and students, he made an appeal for their cooperation and support for maintaining peace and bringing all round development of the area and the district. Speaking on the occasion, Parliamentary Secretary (Industry and Textile &Handicrafts) Karya Bagang requested the public to extend their cooperation in development of the area in true sense. Later in the day, Waii visited the Police Station at Chayangtajo and enquired about the strength of police personnel and its infrastructural need. He also visited the place of horrific incident at Wada Camp in which DSP Late Bomto Kamdak was martyred in a shootout with alleged criminal Tagyung Yangfo. He interacted with the wife and relatives of Late Sai Bagang who was caught in the ill-fated crossfire and lost his life. Home Minister assured to provide all possible assistance to the widow of Lt. Sai Bagang as per provision admissible under relevant govt. norms. Stating that a criminal has no caste or creed, he reiterated the zero tolerance policy against crime of State government and sought cooperation from the villagers in early nabbing of the absconding criminal and bringing the guilty to justice. On inspecting the PMGSY road connecting Yangfo and Jayang Bagang villages, he agreed to look into the long pending demand of the villagers and accordingly, assured to release additional amount of Rs. 2 crore for early completion of proposed bridge. At Bameng, he attended the labour awareness programme being organized by Arunachal Pradesh Building and Other Construction Workers Welfare Board (APBOCWWB) and distributed TV sets, raincoats and gumboots to its registered workers. He visited the ITBP camp and KGBV School and distributed solar lanterns and TV set to ITBP personnel and school authority. He surveyed the ongoing construction work of ADC office, ADC residence and Bameng township road. During inspection of the road from zero-point junction to Chandmari across Bameng town, he directed the executing agency to ensure proper drainage system and erection of retaining walls wherever necessitated. He enquired about the drinking water supply and its proposed action plan and emphasized for better and continuous supply. He enquired about other ongoing developmental activities and cautioned against any substandard and poor quality of works. He requested the public to extend wholehearted cooperation for rapid and progressive development of the area.